Known as Curcuma Longa, The Magical Antioxidant and Anti-inflammatory Spice. It is relaxing, balancing and stimulating. It is known to have anti-inflammatory effects, and may be used to prevent arthritis and other inflammatory conditions. Inflammation usually includes pain, redness, and swelling in the damaged preventing joint inflammation provided treatment started before, not after, the onset of inflammation. Turmeric contains components that are both anti-inflammatory, making it useful for treating arthritis. 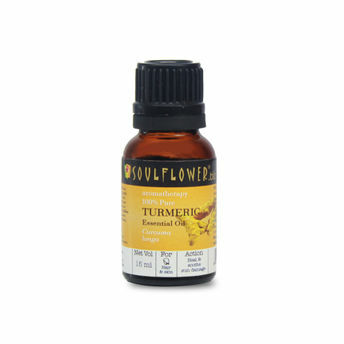 Turmeric Essential Oil is relaxing, balancing and stimulating. It uplifts the spirit and calms down the mind of any stress. Turmeric is an effective aid in treating respiratory problems like asthma, accumulation of phlegm, common cold, cough, flu etc. Turmeric protects the skin from harmful bodies and gives a flawless fair complexion. Turmeric essential oil is celebrated to treat wounds, wrinkles, pigmentation of skin, pimples, acne, psoriasis, cuts, burns and other skin infections. Turmeric Oil has anti-inflammatory effects and it is used to prevent arthritis and other inflammatory conditions like pain, redness, and swelling.